By using a full-featured set of label design Wizards, even beginners are able to create labels quickly and easily. Any label layout can be designed by combining Windows and printer fonts, bar codes, drawing elements and graphics files. Flexible design tools, presented in a user interface that conforms to the latest Windows standards, help users create labels accurately and quickly. Labels can include a wide range of variable fields such as prompted values, serialized fields and date and time stamps. When working with longer variable fields, usually from a database, users will value the powerful paragraph text object with a Best Fit option, variable label length and total text alignment control. Advanced users will appreciate Label Inspector, which gives the user complete control over one or more selected elements at the same time. NiceLabel products provide support for all industry-standard bar codes, including 2-D. With multiple options for check-digit calculation, any possible requirement can be supported. Users are often confronted with particular customer or industry-specific (chemical, automotive, etc.) compliance requirements. 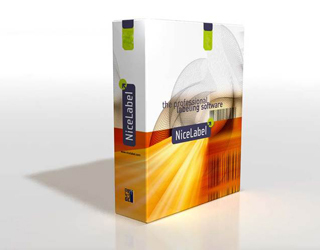 NiceLabel provides pre-designed templates and performs automatic bar code validation control. Thanks to leading support for all the latest Automatic Identification standards and emerging Radio Frequency tags, all current or future compliance issues are addressed worry free. Streamline the process of RFID tag programming by combining the process with label printing. NiceLabel allows easy configuration of RFID tag data structuring and printing. NiceLabel Pro enables users to program RFID smart labels as it prints a traditional label. The simple user interface allows the designer to use the same data that is printed on top of the label to be programmed to the RF tag as it passes beneath the print head. Additional data manipulation is often required during label printing. Linked fields, advanced serialization options and arithmetical functions are just a few of the many special data-processing features available in NiceLabel. Advanced users will welcome the Visual Basic Scripting support, allowing them to perform almost completely customized label data control. A user-friendly Database Wizard is available to guide beginners quickly and easily through standard operations such as manual record selection or complete database printing. Advanced users can take advantage of a built-in data query builder or write their own SQL commands. In addition to the standard support for text files, common database types and ODBC drivers, high-performance native drivers are also available for enterprise databases (Oracle, MS SQL Server, AS/400, Informix, etc.) where increased data extraction speed is important. You can compare this module with the Windows spooler; however, the NicePrintQueue offers more control over network printers and more functionality. The label printing process must often be thoroughly integrated with enterprise applications such as ERP, WMS, Microsoft Office, inventory management software and many others. NiceLabel excels at seamless integration, with a variety of options available to meet the requirements of any system. A set of special NiceLabel commands make it possible to automate label printing from other applications using "job files" or command line options. Programming tools provide a good opportunity to completely control the label printing process from the users custom Windows application. Through a rich ActiveX programming interface, users are given numerous functions for opening and changing labels, specifying label data and printing to a selected printer. When NiceLabel is controlled through other programs, it performs as a print-engine, completely transparent to the printer operator..